The mainstream news is painting the Greeks as the bad guys, and the Troika as the savior of Europe. Quite frankly, it is really disgusting. 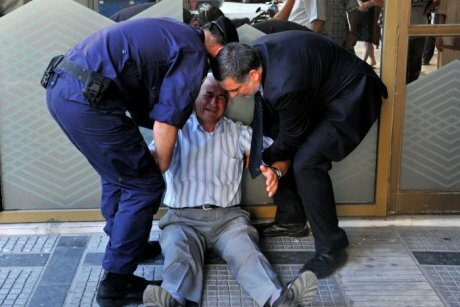 Pictures of an elderly Greek pensioner have gone viral, depicting what the Troika is deliberately doing to the Greek people by punishing them for their own failed design of the euro in a system that is just economically unsustainable. 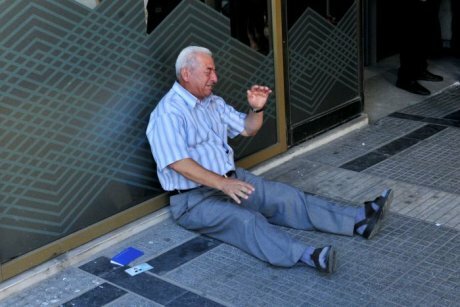 The heartbreaking photographs circulating are of 77-year-old retiree, Giorgos Chatzifotiadis, after he collapsed on the ground openly in tears, driven to despair, outside a Greek bank with his savings book and identity card strewn next to him on the ground. This illustrates the horror the Troika is deliberately inflicting upon the Greek population. This image illustrates the core of the issue: ordinary Greeks tormented by EU politicians who pretend to care about people. This is not a Greek debt crisis, this is a Euro Crisis and they refuse to admit that what they designed was solely for the takeover of Europe at the cost of the future of everyone, from pensioners to the youth. This is just the tip of the iceberg. We are facing terrible times ahead because socialism is completely collapsing. Government employees have lined their pockets, which is precisely the endgame and how Rome collapsed. It was not the barbarians at the gate. It was that the Roman army was not paid and they began hailing their various generals as emperor and the attacked cities who did not support their choice. Only after weakening themselves, then the barbarians came in for easy pickings. If Russia really wants to take Europe, all they have to do is be patient. They will self-destruct for the Troika cannot see any change in thinking for that means they must admit that they were wrong from the outset. Keep in mind: do not keep all of your money in one place. Keep a stock of cash outside the bank. Cash is recognizable for daily transactions, for now. « What if NAFTA Became a Monetary Union?